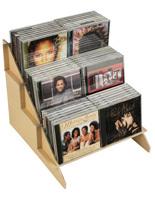 The CD Racks are Great Ways to Get Promotional Merchandise Noticed. The Double Holders will Allow for Twice as Many CDs to be Presented for Purchase. 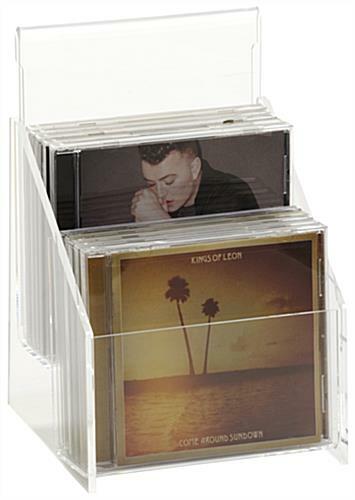 The CD Racks are Made of Clear Acrylic to Draw Attention to What is Placed in Them. 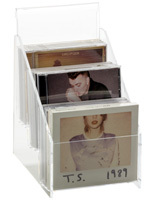 Design of holder probide 2 shelves to hold up to 10 music titles. Custom header makes placement of customization signs or advertisements easy. Small footprint of the stand is perfect for use on registers or cash wraps! 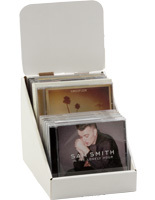 These upscale CD racks look great in many styles of décor. 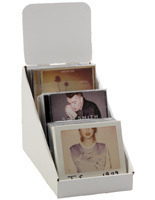 These music displays hold up to 5 titles per pocket for a total of 10 items. 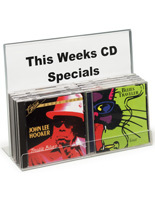 The acrylic CD racks measure 6"w x 8-3/4"h x 5-1/2"d. They feature a message backing that is able to accommodate images that are 5"w x 7"h. The clear stands, CD racks provide a 5"w x 2"h clearly viewable area to highlight your custom signage above your CDs. 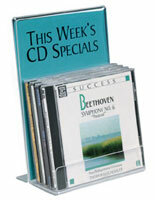 The CD racks, called music holders, are able to display customized signage that can be made with any word processing program. The plastic model is ideal for commercial Point of Purchase settings. 32.0" x 8.8" x 5.5"